Marion Davies in a portrait taken for her final film, Ever Since Eve, in 1937. 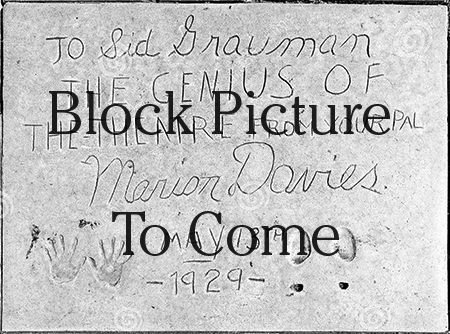 Marion Davies holds a unique place in film history. After a lightning rise as a showgirl and as an actress in films, she became involved with millionaire publisher William Randolph Hearst, who then produced and promoted all her films. This relationship has forever tainted her film work: was she really good, or was it Hearst's insistance his girlfriend was a movie star? Born in comfortable circumstances in Brooklyn, New York, Marion was the youngest of three sisters and two brothers. Eldest sister Rose wanted to act; she changed her name to Davies, and her sisters followed suit. Marion became a chorus girl in New York, becoming a Ziegfeld Girl in 1916, at age 19. Breaking into films by writing the scenario for Runaway Romany (released in December, 1917), her older sister Reine's husband, Broadway producer George Lederer, directed the film for Pathé release. Runaway set the pattern for Davies: a madcap romp, with Marion in the lead — start at the top, girl! The very next year, 1918, newspaper publisher William Randolph Hearst entered her life, setting her up with her own production company, Marion Davies Productions, which made five features in 1919, beginning with Cecilia of the Pink Roses (released in June, 1918) In late 1919, Hearst thought better if it, setting up Cosmopolitan Productions to make her films — as well as occasionally others — from then on. It has been said that Hearst forced Marion to appear in over-produced, dreary historical costume pictures, such as When Knighthood Was in Flower (released in September, 1922). But this is only partly true. Marion's nature was upbeat, partyish; an intensely people person, friends with everyone, fond of practical jokes. But comediennes don't get all the respect they should, and so, the costume pictures continued: Yolanda (released in September, 1924), Janice Mededith (released in December, 1924), Lights of Old Broadway (released in November, 1925), Beverly of Graustark (released in April, 1926), Quality Street (released in November, 1927), and Marienne (released in August, 1929) — Marion's first talkie, also filmed as a silent). Almost all of these films had some comic element to them, which went beyond comedy relief. But in viewing Davies' films today, it's her comedies which make a case for her obvious talents as a performer. Adam and Eva (released in February, 1923), Little Old New York (released in August, 1923), The Red Mill (released in January, 1927), Tillie the Toiler (released in June, 1927), The Fair Co-Ed (October, 1927), The Patsy (released in March, 1928), The Cardboard Lover (released in September, 1928), and Show People (released in October, 1928), all are delightful films even today. But still, the suspicion remains: if Hearst hadn't been pushing for her to be a Big Deal, would she have made so many films? If he hadn't been meddling with her material, might she have made better films? Davies continued to make films up until Ever Since Eve (released in July, 1937) made for Warner Bros. 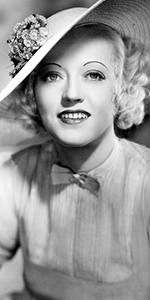 Retiring from the screen, Marion devoted herself to looking after Hearst, and made donations to a children's hospital at UCLA, which today has a Marion Davies Clinic. After Hearst's death in 1951, Marion married Horace G. Brown, but it was not a happy marriage. Her health declined, culminating in a diagnosis of stomach cancer in 1960. She died in 1961, at age 64. Her tape-recorded reminiscences were published as her autobiography The Times We Had in 1975. Grauman's Chinese Theatre, Hollywood, California. 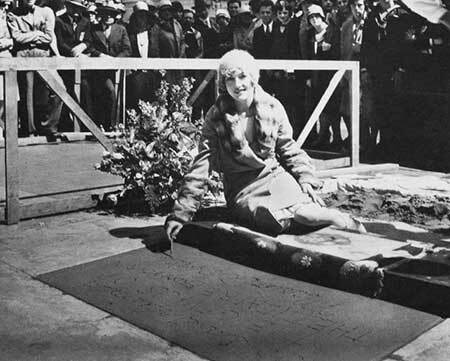 Marion Davies Forecourt ceremony, Monday, May 13, 1929.